Okay. It's time to break down and spend the money on a pair of sock blockers for photography purposes. How do I know? Because I just took a photo of a sock with a cheese grater inside it. At least that photo turned out better than the one of a sock with the DVD remote control in it. If you like the waffle texture on the non-ribboned portion of the cuffs, it's ridiculously easy: Knit 3 rounds, then work (K1, P1) rib on the 4th. The original pattern called for seed stitch, but that sounded like way to much purling. 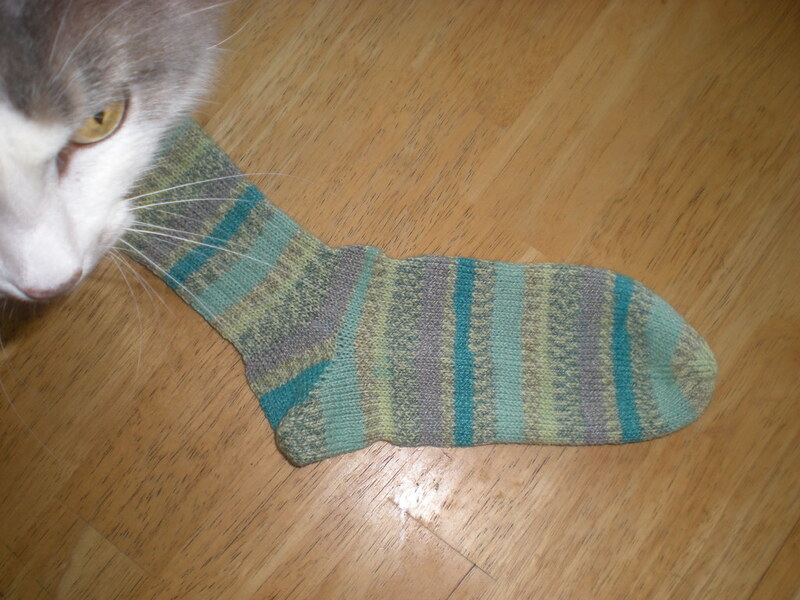 When I tried to photograph my latest stockinette sock, I ran into a problem. The pictures turned out fuzzy. I promise I've got the second sock on needles already. Casting it on immediately isn't a surefire cure for second sock syndrome, but at least it keeps me from using the right set of needles in some other project, stalling out the second sock indefinitely. In fact, there is a solo sock on my coffee table right now as a result of the last time I failed to segue directly to the second sock; I robbed the needles for the purple ankle socks instead. 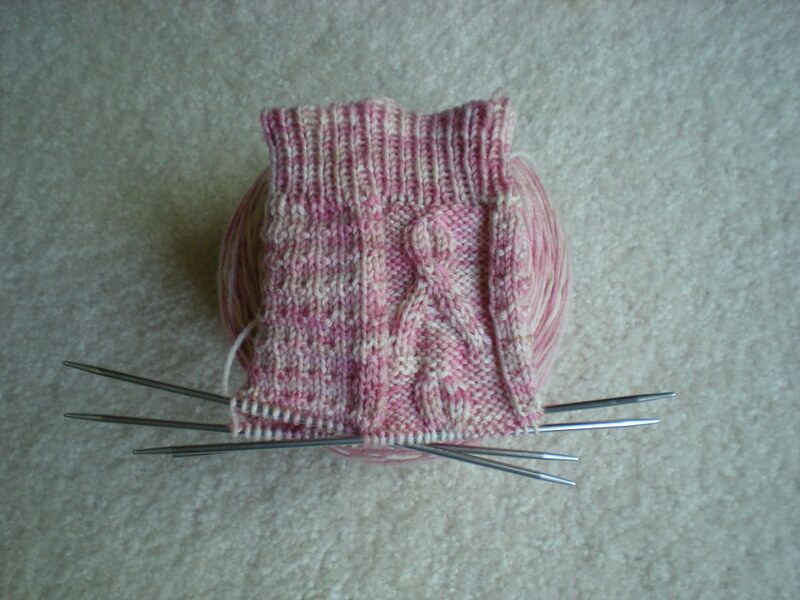 At least I've managed to cast on a non-stockinette sock. It's a charity project; I plan to donate the finished pair for the local Race for the Cure raffle in the fall. 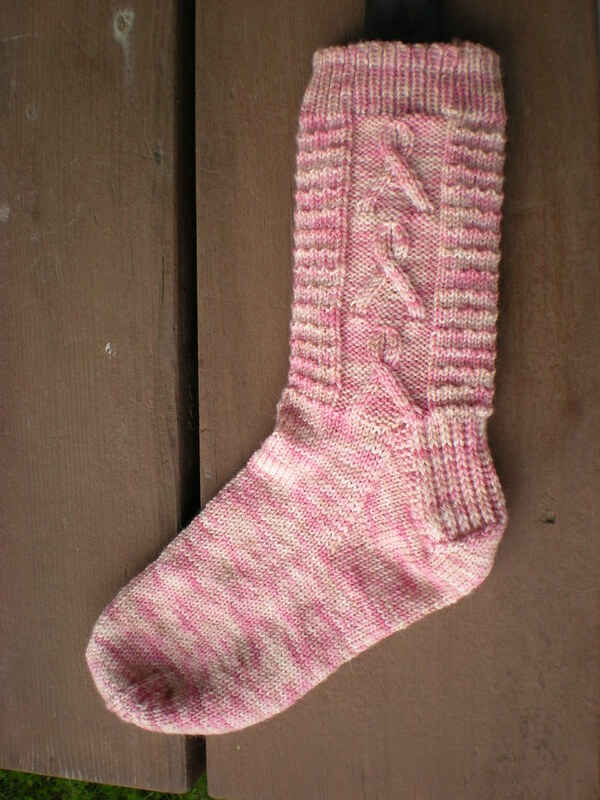 I'm using (by which I mean modifying) the Pink Ribbons: Breast Cancer Awareness Sock pattern by Lisa Lloyd, graciously distributed by her for free. 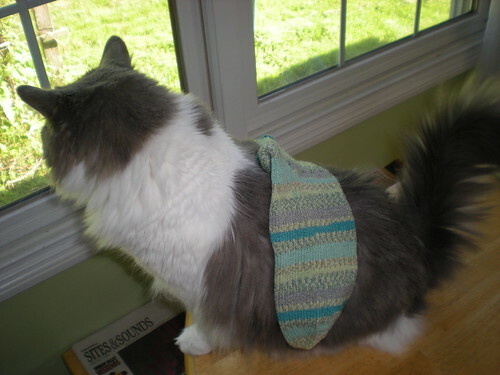 I've been in a stockinette sock slump again lately. This time I was carved into that rut so deeply that I made four matching socks. They're all knit from one 100-gram ball of sock yarn (Opal Cotton). 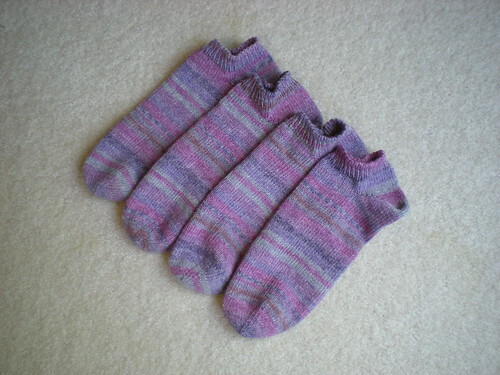 How did I know I had enough yarn left to knit a second pair of socks? I used my kitchen scale. I've got a good digital one that will measure in grams or ounces. When I finished the first pair, I popped the rest of the ball on the scale; since it still weighed 54 grams, I knew I had enough for a second pair. By the way, I would have run out of yarn if I hadn't made them fraternal quadruplets (they're not quite identical, since the subtle stripe pattern falls differently on each sock). A postal scale will also do nicely, and if you don't own a scale, all you have to do is stop by a post office with a self-serve scale in the lobby.